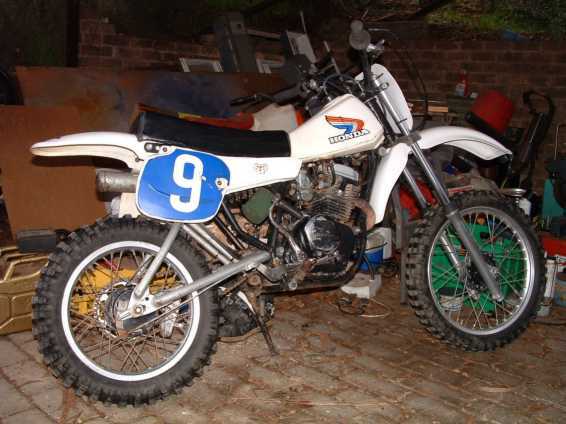 This is a 1981 Yamaha YZ80 small wheel fitted with a Honda XR100 motor. It was built in the early 1980's and the motor fits into the frame with no cutting. Tyrone Parris will be riding this bike for ACS Racing in the final rounds of the Thumper X series and other events. Tyrone joins ACS Racing after riding the Yamaha TTR125 and the Honda CRF100 and not being able to stop grinning about the fun he had. Tyrones nick name is Biff and he is known far and wide as Biff. I have known him for years but I have no idea where the nickname came from. Tyrone is 14 yo and races a Kawasaki KX85. The Yamahonda 100 will undergo a rebuild to tidy it up and it will be fitted up with a new custom pipe, ported head, cam, big bore, new carb and a few other things. Its a bit like a Honda XR80 with suspension and more power! Tyrone should be fast on it as it has drum brakes front and rear.